Sometimes I wish that I was homeschooling Z because there are so many fantastic non-fiction picture books out there that I could use in a variety of subjects. Electrical Wizard: How Nikola Tesla Lit Up the World, written by Elizabeth Rusch, illustrated by Oliver Dominguez, might not fully represent the handsomeness of this scientist but it does portray the hard work and genius of the man. It starts with Tesla's childhood in Serbia (including the name of his cat), moves through his college years and finishes with his professional life. It also has six pages of history and science at the end and a great bibliography. 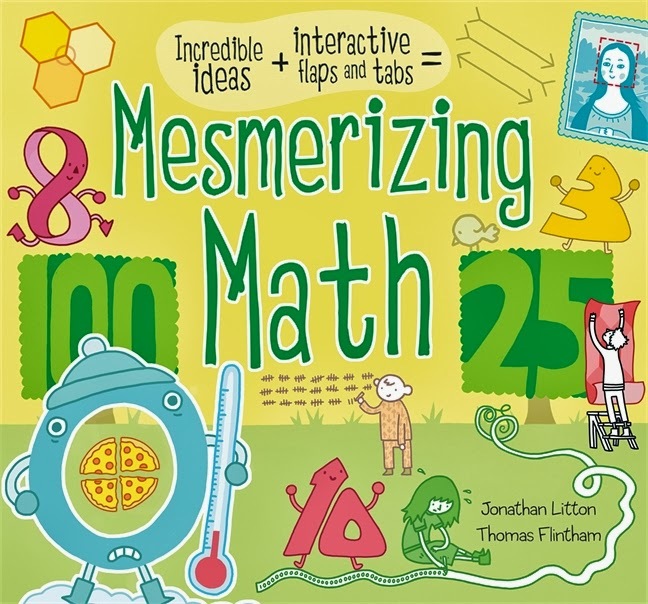 Mesmerizing Math by Jonathan Litton and Thomas Flintham is a totally amazing flap-and-tab book that gives a quick introduction to dozens of math concepts, from geometry to tessellation. Z was fascinated by this book and all of its hidden information. 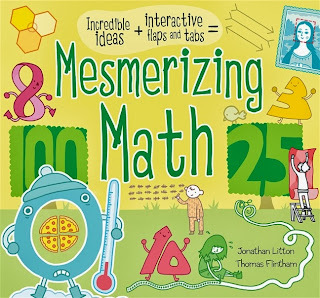 I like that it makes math fun and accessible. This book obviously won't teach kids everything they need to know about the diverse ideas (it's only 16 pages long), but it will give kids a familiarity with concepts and terms that should help later when they reach these concepts in their studies. 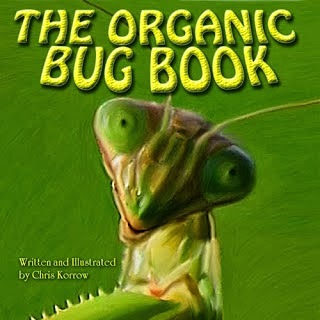 The Organic Bug Book by Chris Korrow (farmer) attempts to get kids to look past the ick factor that they may have learned from squeamish parents to the true usefulness and fascinating qualities of a variety of insects. Not all bugs are welcomed by farmers but many are grouped together unfairly with the true pests. This book tries to clear up some of the misconceptions and to celebrate the diversity of insects. Marije Tolman (artist) and Jesse Goossens' (writer) Jumping Penguins is a beautiful tribute to the many amazing qualities of animals that one might see at a zoo. The artwork is not realistic (bats have bandages, polar bears are painting and there's a blue whale on a scale) but the book is oh so fun and the facts might be ones that you haven't heard before -- bison can jump six feet vertically, polar bears are left-handed and caterpillars throw their poop away from their bodies to confuse wasps that would want to eat them. This would be a fantastic gift book as well because it's just so attractive! 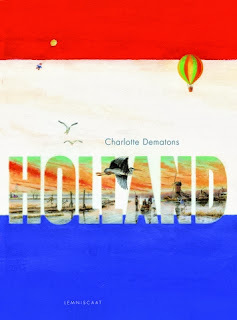 This beautiful duo from Charlotte Dematons, Holland and A Thousand Things About Holland (with text by Jesse Goossens), give a wonderful introduction to a beautiful country. One is a book without words, simply presenting Holland from the water through the busy cities and on to the countryside. 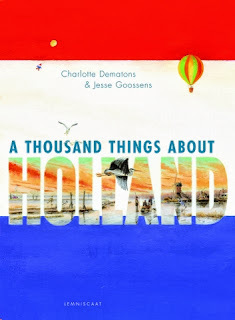 It has many details that should give young readers an idea of the things that make Holland unique. The other is, well, a book of a thousand pieces of information and literature about Holland's history, weather, cities, people, art and more told from the unique perspective of Dematons, who was born in France but studied art in Amsterdam. 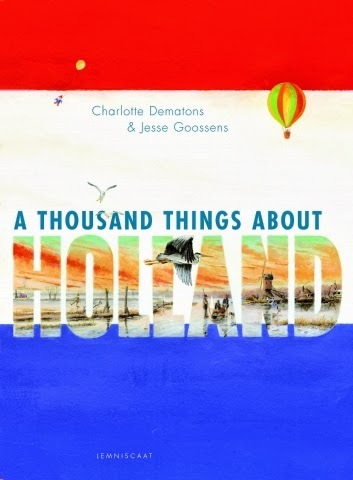 Obviously, with 1000 "things", there's a lot to learn about Holland, especially for kids with little previous exposure to the country. Luckily, there are no limits on where one can learn, so we can bring all of these books into our home anyway (and you might want some of them in your home too). 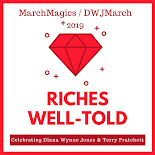 books like those certainly inspired me when I was young. Indeed! I still remember many non-fiction titles from childhood. The nonfiction books I had as a kid have stuck with me for ages. These look wonderful, and I laughed out loud when I clicked on the Tesla link. He looks so coy in his Wikipedia picture, like he's saying, Hey girl, you know you want some of this. I ONLY CARE ABOUT THE SCIENCE SIR. 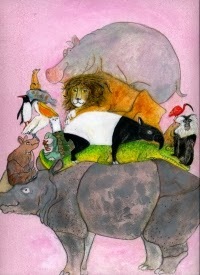 I think illustrated books are so essential to learning, whether homeschooled or not! I remember poring over the Time Life series because it was half pictures - so great for understanding and holding your attention. These look like a great selection of picture books - thanks for highlighting them! So true. Z is not a big math fan but Mesmerizing Math had him totally absorbed and asking questions. It was awesome to see.